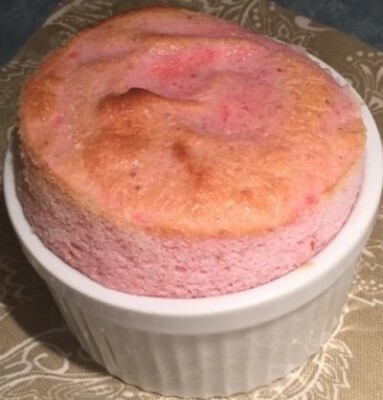 I don’t make soufflés all that often, but when I do, I often think of the fear this dish causes. They’re difficult to master, they require so much work, they deflate as soon as you take them out of the oven. Honestly- I wouldn’t waste the time worrying like that; I’d take the time and start baking. Besides just giving it a try, I’d also recommend reading and following the directions. Go step by step through the recipe, before cooking, and then follow it to a T once you start. You should be delightfully surprised to see that you, too, can master a soufflé. To learn more about this strawberry soufflé recipe from June 2015, keep reading. The first week of our egg theme was easy; I had been holding onto that recipe for a couple months. The second week required a bit more thinking. Although we have chickens and, as such, cook with eggs often, I tend to make items that we’ve already covered at Think Tasty, such as egg white wraps and French toast. I decided to think about using eggs in a dessert instead of in a savory format. If you search egg white desserts, meringues are high on the list but so are soufflés. Many of them are chocolate-based, which is not my cup of tea. However, if you can add chocolate to a soufflé, why can’t you add some other wet ingredient, such as puréed strawberries? Thank goodness my assumption was correct. For those of you reading this and thinking, I couldn’t possibly make a soufflé, I am here to educate you. This dish is not as scary as it seems. As long as you whip the egg whites until stiff and gently fold in the purée, you will succeed. If you serve them shortly after baking, they will be puffy and tall. Do not let the fear of a soufflé stop you from trying this recipe. As this dessert is light and fairly healthy (probably about 100 calories a serving), you may want to enjoy a tasty beverage with it. This week we are pairing this dessert with the Bubble Benedict from Loews Ventana Canyon Resort in Tucson, Arizona. Be sure to visit Parched No More to find the recipe! In a blender, combine strawberries, lemon juice, 3 tablespoons sugar, and cornstarch. Blend until smooth. In a stand mixer, beat egg whites to soft peaks. Add remaining sugar a tablespoon at a time and a pinch of salt; continue beating until there are stiff peaks. Whisk 1/3 of strawberry mixture into the egg whites. Gradually fold in remaining strawberry purée until everything is evenly combined. Divide batter among the ramekins. Bake for 14-17 minutes, until the tops are golden brown.